Searching for new floor material that's suitable for use in powder rooms? Our reputable store has just the right solution for you – bathroom tile. Our huge showroom is filled with a broad variety of tiles made from granite, ceramic, marble, slate and limestone. We have bathroom floor and shower tile that is priced affordably, so you are sure to find a product that fits your price range without having to sacrifice on aesthetics. Whether you want floors that look modern and sleek or you prefer more traditional styles, you are going to find the most beautiful tile choices at our showroom. Tile is stain- and scratch-resistant, which makes it ideal for high-traffic areas of your house, and bathrooms are one of the highest traffic rooms in any home. If it is properly taken care of, ceramic floor tile is capable of lasting a very long time. Grout and sealants deter water from dripping through cracks and ruining sub-flooring, and the tile itself if almost impervious to water, making it an ideal choice for bathrooms. Also, because of tiles water resistance, cleaning it usually just requires a mopping. Few flooring choices are as versatile as tile. It is used on floors, backsplashes, walls, showers, countertops and more; your imagination is the only limit for tile. There is a reason some of the best buildings in history chose to decorate with tile. Who doesn’t love ceramic floor tile? This tried-and-true flooring has stood the test of time over centuries of use across the world. From the ancient Greeks and Romans to modern day Americans, ceramic tile has been a staple of beautiful flooring. While the initial investment is more expensive than some other types of flooring, tile raises your home’s value, and if you treat it right it lasts for the life of your home. The great benefits of ceramic don’t just stop at floors though. 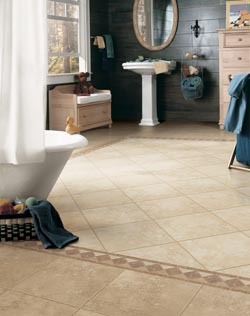 Ceramic bath tile is a very popular choice when picking out shower tile for your home. It makes a great addition to any bathroom because of how easy it is to clean. The time you save every time you clean your bathroom really adds up after a while. Our bathroom tile flooring installation experts are here to help you achieve the bathroom of your dreams. All of the great benefits of ceramic floor tile are also applicable to walls as well. When your walls and floor are both covered in tile your bathroom becomes a much more hygienic place because of how easy it is to clean it. Best of all, because tile is so water resistant, mold and mildew become a problem of the past. So long as you take care of your tile with the minimal maintenance that is required, your bathroom should stay looking beautiful for decades to come. All tiles are not made equal. The process involved in making tile varies from company to company, which makes a big difference in the quality of the tile you buy. Our showroom is very selective about the tile that we provide, because we want our customers to be able to choose from the best. When it comes to bathroom tiling, your tile is only as good as the installation. That is why at Flooring America, we guarantee our labor and installation to make certain that your floors look gorgeous for many years to come. Contact us for all of your bathroom tile needs. We serve Decatur, Forsythe, Mount Zion, Macon, and Solomon, Illinois, and the surrounding areas.